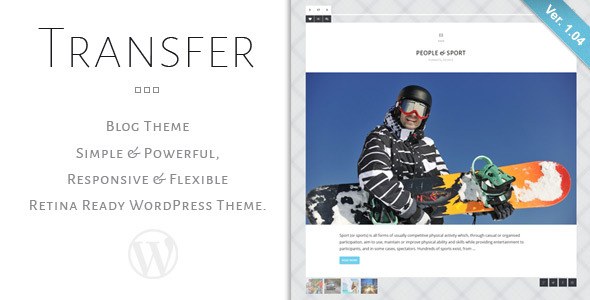 Transfer is a simple but powerful WordPress theme. Transfer theme can be configured to focus on your photos, blogging, etc. Theme is powered by the Redux Options Panel, which provides tons of options to manage and modify any aspect of the theme — it is well suited for both beginners with no coding knowledge and developers. Transfer theme developed on the Bootstrap — beautifull boilerplate for responsive development so it look beautiful at any size, be it a 17” laptop screen or an iPad, iPhone. Want more themes like this? Sign up to the Color Theme newsletter and we’ll keep you up-to-date with updates, release dates and early demo access – nice! Trasnsfer is Multi-Lingual / RTL Ready!